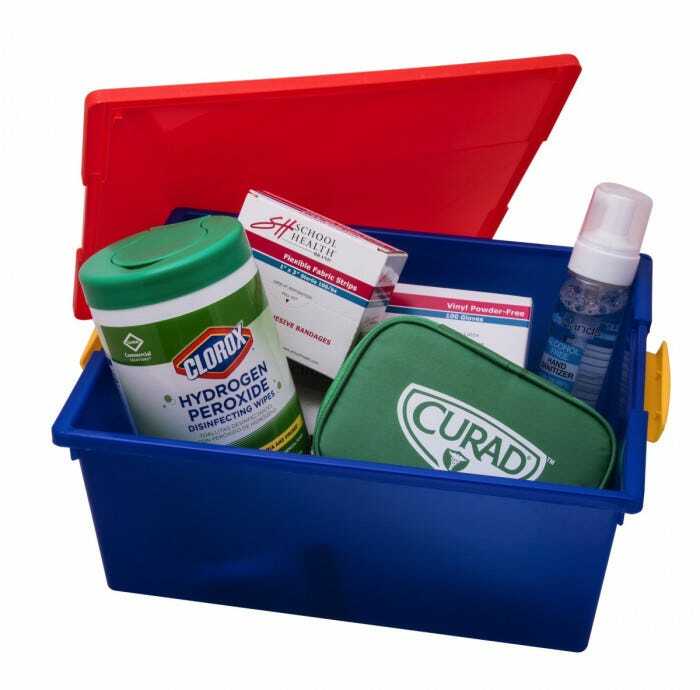 Keep cleaning and first aid products organized and close at hand. Outstanding sensitivity, softness, and comfort. Medium size, box of 100. Not made with natural rubber latex. Kills 99.99% of common germs that cause illness. Evaporates quickly, no sticky residue or skin irritation. Gentle and safe enough for multiple daily use. No fragrances or dyes added. 7-ounce pump. Breaks down soil and stains, destroys odors and provides color-safe bleaching action. Kills most viruses and bacteria in 30 - 60 seconds. No harsh chemical fumes or smell. No fragrances or dyes added. Hydrogen peroxide breaks down into water and oxygen after use, leaving no active residue behind. Flexible and form-fitting for added comfort and mild compression. Highly absorbent wound pad with 360 degrees of adhesive protection. 1" x 3", box of 100. Provides easy storage and organization. Snap-down buckles securely fasten the lid to box. Integrated handles make it easy to move, carry, or pull off a shelf.